Ah yes. Digital marketing. Once a great champion. Now a broken-down has-been, struggling to remain relevant in a changing world. Like Joe Namath, but with a keyboard. So goes the story in many agencies today. In their zeal to jump aboard the social media express, agencies are neglecting to shore up the other corners of the digital marketing foundation – many of which deliver more concrete ROI (at least for now). Further, while social media is the most transformative because of its impact on brand>><<consumer relationships, it’s certainly not the easiest (or most lucrative) professional service to offer clients. 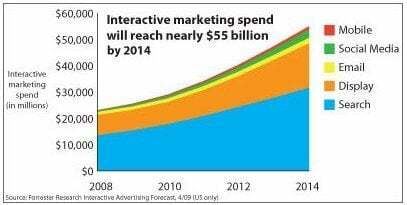 Forrester’s recent projections of interactive marketing spend through 2014 show social media increasing at an average of 34% year over year. That’s pretty spectacular, sure. But, for all the Twitter this and Facebook that, remember that even five years from now banner advertising will be 5 times bigger than social media, and search marketing will be 10 times larger. Should agencies develop social media competencies, and help their clients create sound, sustainable social media strategic plans? Absolutely. But, social media does not work as a solo act. Because almost every other aspect of the company manifests itself in some way in social media, it’s imperative that social activities are integrated with other elements. Thus, if you want to get serious about being an agency that can provide social media services, you better be able to offer meaningful email marketing, mobile marketing, search marketing, and online advertising counsel. That’s why the notion of centralizing social media expertise in a personnel silo is a short-term gratification, but a long-term mistake (like most tattoos). If you accept the premise – as I do – that before long everything will have a social component, you can’t have only one or a few people in your agency holding those keys. Everyone in your agency needs to understand social media, and while they’re at it, get comfortable with search, email, mobile, banners, and analytics, too.